You spend a lot of money to attend a conference for professional learning. You get flights lined up, hotel, transportation, etc. Then you go to the event. You spend the first hour trying to find the registration desk. You wait in line for a half-hour to get your badge. Then you plop down on the floor and start looking over the schedule guide to see what sessions you’ll attend. There’s so many choices, it’s almost overwhelming. It’s like walking into Costco without a shopping list. You go in wanting one thing, and you come out owning a 3-lb lobster claw that you didn’t know you needed. Once you do decide on a session, you stand in line for 15 minutes hoping to get in. Others are over capacity and you can’t get in, which causes you to speed walk 1.2 miles down the convention hall only to walk in late to a session and find the dreaded seat in the very middle of everyone. After several hours of this, you are ready for an early happy hour. You see people laughing and having fun, but you’re not sure what they are laughing about and if they are in fact having fun. At about 2pm, you find a local watering hole with fellow attendees trying to hide their badge of shame around their necks as you are all clearly failures. I would argue that you are not the failure, but instead that the conference event failed you. In its desire to pack the house with thousands of people, the large conference has lost focus on what’s most important: the attendee experience. Sure there are amazing speakers from all over and great content, but the UX (user experience) is severely lacking. Why go stand in line for a movie you might not want to watch? On day 2, you wake up with a headache both from the early happy hour and the brain fog that comes from being overwhelmed. You go to the keynote, hoping for some inspiration. However, you are now “cattled” in and out of a 5000-seat arena where you end up skipping sitting down because you forgot to charge your laptop. So, you find a spot on the floor next to one of the 4 plugs in the 30,000 sq. ft. room. The keynote speaker is good (they usually are, to be fair) but now what? Do you engage in conversation with someone? Do you rush out the door before the closing remarks in the hopes of not being a part of the herd? All of these above scenarios have been part of my experiences attending large conferences in the past. I feel like I spend much of my time being shepherded around or looking for the next session, but rarely walk away with my money’s worth in terms of knowledge and experiences. In fact, the best learning usually happens in conversations and dialogues with colleagues or things posted on the conference hashtag. With all this in mind, in 2012, we created an event called iPadpalooza. We didn’t want to call it an “iConference” because we really wanted it to be something quite different. We wanted it to be a learning festival. A place to experience something different as an attendee. A place where the things that matter the most, the interactions, discussions, and collaboration are the focal point of the event. Flash forward to present day. Taking all past experiences, both good and bad, when it comes to professional learning, we are attempting something, well…different. 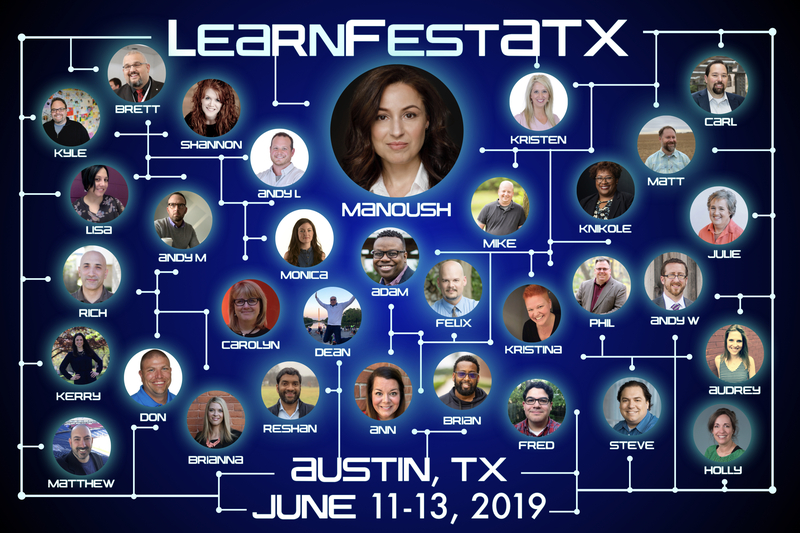 The event formerly known as iPadpalooza is now LearnFestATX (after all, it’s about the learning, not a device). Last year, rather than just changing the name and moving on, we decided to beta test some new concepts in professional learning with a much smaller audience. Following that beta test, we discovered what worked and what didn’t. Taking just the parts that worked and adding in some of our own magic, we have created what we feel will be an event from the future, for the future. As someone attending, you’ll experience learning in three different ways. The first way is the most traditional in terms of learning as part of a large group (during opening and closing events) or a medium-sized group (during interactive and make-n-take sessions). The second way is learning as part of a collaborative team either with our Teacher Shark Tank or the APPmazing Race. The third way is learning as an individual by reflecting in our Mindfulness Lounge, participating in our digital petting zoo, lunchtime interactions, or attempting to win our massive easter egg hunt (details revealed at event). While the traditional conference puts featured speakers in certain rooms and only for certain times, we want our featured speakers to be much more part of the event. They should be learners too. As an attendee, you should have multiple opportunities to interact with them as well. Sure, there will be some scheduled sessions, but now with our new Mindfulness Lounge and Expert’s Lounge, you’ll have opportunities to sit, relax and reflect with some of the top educational experts around. Our featured speakers will also be playing multiple roles in some of the experiences that are taking place, from Impractical EdTechsters to the Ed Tech Family Feud to a Poetry Slam, you’ll see these folks in roles that stretch their thinking and yours. I can’t give away too much here, but for those that attended our beta-test last year with the “Silent Disco” presentation style, we’ll be doing that on a much larger scale during our opening session on June 12. Also, we’ll be bringing back our “What’s HOT in Ed Tech” challenge for the closing ceremonies. Let’s just say it involves some new ways to “spice” up a talk to a large crowd. We’re also super-pumped to have Manoush Zomorodi as our day 2 Keynote speaker. These large groups events will have tons of audience engagement as well as boat-loads of door prizes. While the main LearnFestATX runs on June 12th & 13th, we will also be having our 3-hour deep dive PreFest LearnShops on June 11th. No more fighting for a spot or a seat. Just buy your ticket, select your sessions, and you are guaranteed a seat. In summary, I’ve always been of the belief that learning is an active sport. Sometimes that’s a team sport, sometimes it’s an individual sport. But the bottom line is, you get out of it what you put into it. This is true of either a traditional conference or our event. The biggest difference is, at our event, you don’t have to try to seek out those learning opportunities. At our event, they seek you out. 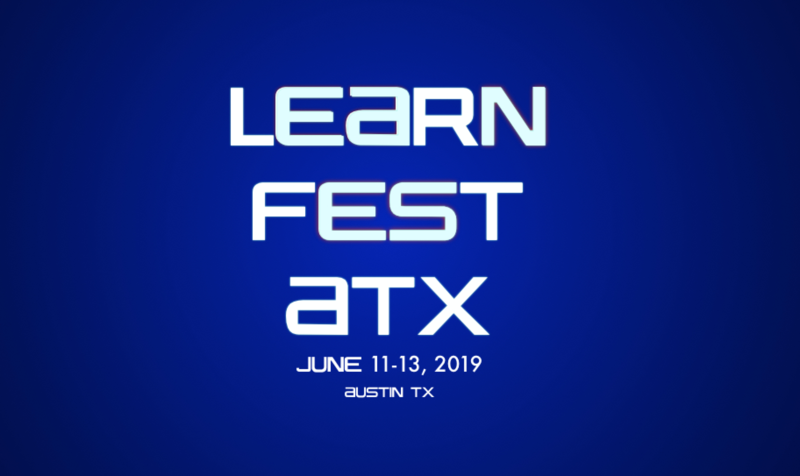 I hope that you’ll join us this summer at LearnFestATX. We do believe that learning as a team can be powerful too, so we offer great group discounts if you want to come hang out with colleagues or meet new ones. With our event, you have the ultimate level of voice & choice. Something we want our students to have as well, so why not model it in a professional learning environment? Hint for those of you that read all the way to the bottom of this page. Try and reach out to a featured speaker to get a 20% off discount! Editor’s note: LearnFestATX was recently listed as one of EdSurge’s top Ed Tech events to attend in 2019!